Agricultural Landscapes: Seeing Rural Through Design follows on from the author’s previous books, Rural Design and Architecture and Agriculture, to encourage using design thinking to provide greater meaning and understanding of places where humans live and work with the rural landscape. Rural areas around the world are often viewed as special places with cultural, historical and natural significance for people. Dewey Thorbeck emphasizes the importance of these rural sites and their connections to urban areas through full-color case studies of these places with particular emphasis on Globally Important Agricultural Heritage Systems (GIAHS), as identified by the UN Food and Agriculture Organization, to document and explore personal experiences, lessons learned, and implications for the future. 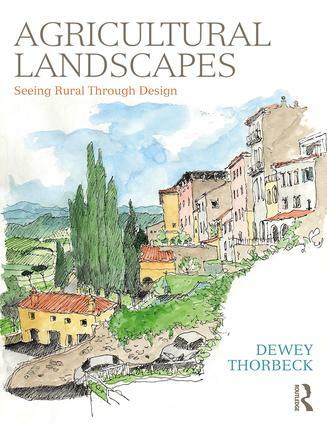 Rural landscapes are part of everyone’s heritage, and the book shows these connections and the unique GIAHS land use systems and landscapes as models for a more sustainable and prosperous rural and urban future. It includes practical examples of working places where growing food, raising animals, or harvesting from the sea has been the primary economy for centuries to exhibit a clear and sustainable local relationship between humans, animals, buildings, climate and place. Aimed at students, teachers and professionals, this book investigates how design thinking can be used to integrate rural and urban sites to shape land use for more sustainable futures.